The Mufulira sediment hosted copper-cobalt deposit is located 30 km north of the town of Kitwe, in the Zambian Copper Belt of central Zambia, 16 km west the border with the Democratic Republic of the Congo (DRC) where the latter protrudes into Zambia (#Location: 12° 31' 22'S, 28° 14' 10"E). The main Mufulira deposit extends over a trike length of ~6 km, and persists down dip for >1300 m on the southwestern limb of the asymmetric Mufulira Syncline where the host Neoproterozoic Lower Roan subgroup laps onto the regional Kafue Anticline. The northeastern limb rests steeply on the Mokambo Dome, ~15 km to the NE, and hosts the Mokambo North and South mineralisation. The Luansobe and Kasaria deposits are located on the same limb and host sequence as Mufulira, some 10 and 15 km to the NW respectively. The main deposit at Mufulira was discovered in 1923, and production commenced ten years later. The initial discovery arose from the recognition of malachite staining on peat moss in the Mufulira stream, and shortly afterwards small copper stained outcrops 4 km to the SE. These surface showings comprised some sparse malachite and chrysocolla staining of footwall quartzites adjacent to a creek following the strike of the 'C' (lower) orebody. There were no 'Ancient' workings. Shortly afterwards, four shafts were sunk to 30 m depth and crosscuts in the mineralised rocks revealed 3 to 4 m of around 1% Cu. In 1928 geologists of the Rhodesian Selection Trust investigated the prospect by drilling and proved up a significant tonnage. Exploitation commenced in 1929 and after a pause from 1931 due to depressed copper prices, full production continued from 1933 until the present. 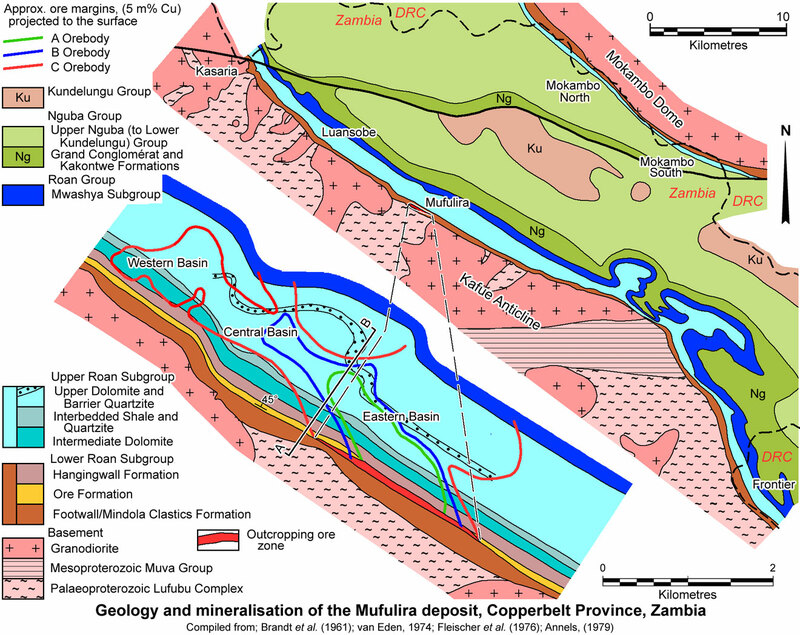 For details of the regional setting of Mufulira, the Central African/Zambian Copper Belt and the Lufilian Arc, see the separate Zambian Copperbelt record. Basement at Mufulira comprises granodiorite, intruded into the Palaeoproterozoic, Eburnian (~2.05 to 1.85 Ga) calc-alkaline magmatic arc sequence of metasedimentary, metavolcanic and intrusive rocks of the Lufubu Metamorphic Complex. The topography of the basement at the onset of Neoproterozoic Katangan Supergroup, Roan Group sedimentation was irregular, with the highest ridges up to 150 m above the deepest valleys (Fleischer et al.,1976). This topography was influenced by the differential resistance to erosion of the granodiorites and the Lufubu schists. Basal Conglomerate, 0 to 20 m thick - a poorly developed boulder to cobble conglomerate, best represented on the margin of a pronounced palaeo hill. Footwall Quartzites and Grits, 0 to 150 m thick - the principal lithology is a grey arkosic cross bedded sandstone, interpreted as including both aeolian and aqueous varieties. Several grit lenses are mapped, as are shale/arenite interbeds near some of the palaeo highs. The arkosic quartzites have up to 35% anhydrite cement in places and range from grey to reddish in colour. 'C' Orebody Quartzite, 3 to 20 m thick - the lowest and most important and laterally extensive orebody, with a strike extent of 5800 m, averaging 2.5 to 3.5% Cu, mainly as bornite. The gradation from the footwall to the ore quartzites shows a marked increase in silicification and loss of the prominent dark cross beds/laminae that define the stratification, to a more massive quartzite. The 'C' quartzite is grey, fine to medium grained, feldspathic, (but glassy when hosting ore), with some grit bands and a chaotic breccia zone. A black carbonaceous massive quartzite occurs within the upper section of this unit in the zone of maximum development of the 'C' quartzite. It contains up to 2% free carbon and abundant sericite. Identical carbonaceous arenites are found within the other two orebodies, but not elsewhere in the sequence. Within the ore there are buff to pale green argillaceous shale bands developed within the quartzite, generally <1cm thick. Anhydrite and gypsum cements are abundant in sections of the quartzite, although within the ore dolomite and sericite are the principal interstitial cements. As the top of this unit is approached within the ore flecks of dolomite increase upwards towards the overlying dolomitic siltstone 'mudseam'. Inter 'B/C' Horizon, 0 to 15 m thick - commences with a 0.3 to 1.2 m (averaging 0.5 m) thick dolomitic siltstone, known as the 'Mudseam', which forms a cap to the 'C' Orebody. In general the change from the 'C' Orebody Quartzite is abrupt, apart from the increase in flecks of dolomite in the upper quartzite. Where sighted underground this is a pale silty unit with associated anhydrite. Further to the east it has cherty layers. The 'Mudseam' grades upwards into a 0 to 1.5 m thick mid-grey banded dolomite and siltstone unit which passes in turn into a 1.5 to 4 m thick interbedded shale and quartzite. This is followed by the 2 to 12 m thick Inter B/C Quartzite which is a greyish pink to a clear and glassy feldspathic quartzite with grit lenses and anhydrite cement. As with the quartzites in the footwall to the main 'C' Orebody Quartzite, these arkosic quartzites are cross bedded, and again the bedding disappears and the rock becomes more massive and siliceous as the base of the 'B' Orebody is approached. This banding tends to have diffuse boundaries in places sighted underground, suggesting a replacive origin. Sections of the Inter B/C Quartzite are mineralised. A barren, extensive stromatolitic dolomite lens occurs at the top of the unit on the western fringe of the 'B' Orebody at the contact with the overlying 'B' Orebody Quartzite. Well developed collenias are observable (Malan 1964). Copper mineralisation is antipathetic to the development of the stromatolitic lens/reef. 'B' Orebody Quartzite, 3 to 15 m thick - grey to dark grey feldspathic quartzite, similar to the 'C' Orebody Quartzite. Black carbonaceous quartzite is also present, but only in the central mining area. Also present, as in the 'C' Quartzite, are slump breccias and grit bands. It thins towards the west where it becomes more argillaceous, but thins more rapidly to the east (as do the 'A' and 'C' Orebody Quartzites). On passing from the Inter B/C Quartzite to the 'B' Orebody Quartzite the rock becomes more massive and siliceous. Inter 'A/B' Horizon, 0 to 30 m thick - commences with a 3.5 to 6 m thick white to pink sugary dolomite (the Lower Dolomite) with associated chert and containing up to 30% anhydrite. This dolomite unit forms the cap of the 'B' Orebody. It is overlain by a 10 to 15 cm thick, well mineralised gritty dolomite known as the 'Gritty Marker', with bornite-chalcopyrite-chalcocite (up to 4% Cu) and sometimes primary uraninite. Following this is a thin (0.5 to 1.5 m thick) barren algal/stromatolitic bed, then 5m of dark greenish grey argillite sporadically capped by a further thin algal dolomite, then 2 to 4 m of interbedded quartzite and argillite, followed by the 2 to 15 m thick pink to rusty Inter 'A/B' Quartzite which is mineralised to ore grade in parts. 'A' Orebody Quartzite, 3 to 12 m thick - grey to dark grey feldspathic quartzite, similar to the 'B' and 'C' Orebody Quartzite. Black carbonaceous quartzite is again present, but as for 'B', only in the central mining area. A characteristic of the unit is the presence of pebble bands towards the top. Ore grades are generally 4.5 to 5.5% Cu as chalcocite and bornite. Lower Argillaceous Quartzite, 35 to 65 m thick - commencing with a shale band and comprising mainly a grey green argillite with irregular arenite bands, this unit caps the 'A' Orebody Quartzite and the orebody itself. Three main dolomite bands occur within it, the 70', 85' and 95' Dolomites, with shale at the top. Gypsum and anhydrite are conspicuous as fracture and joint fillings. Marker Grit, 4 to 6 m thick - gritty pink quartzite. Upper Argillaceous Quartzite, 20 to 45 m thick - sandy argillite, similar to the Lower Argillaceous Quartzite, with a dolomitic band at the top. Glassy Quartzite, 6 to 12 m thick - very hard and compact, glassy white to grey quartzite with minor shale bands. At the top a persistent (over 100 km strike) thin mineral zone is present as a 2 to 3 m thick partly carbonaceous dolomite with minor pyrite, chalcopyrite and bornite. Intermediate Dolomite, which comprises dolostone, talc-schist, argillite and minor quartzites. The base of the unit is marked by a 0.5 to 1.5 m thick grey silty dolostone, in which pre-consolidation slumping and brecciation are obvious. This is followed by a thin and impersistent dark grey dolostone, and by up to 25 to 35 m of dolostone and talc-schist, before the Middle Quartzite, which is, in turn, overlain by the Upper Intermediate Dolomite sequence. The 6 to 12 m thick Middle Quartzite is grey to greyish-pink, glassy and slightly dolomitic. The Upper Intermediate Dolomite is 30 to 45 m thick, and is predominantly dolostone to the east, with argillite beds up to 6 m thick near the top. Further argillites appear and increase in frequency westward, to dominate in the west, where they are greenish-grey, massive and usually carry disseminated pyrite. Gypsum and anhydrite occur throughout the Intermediate Dolomite, except in the quartzite beds (Brandt et al., 1961). Interbedded Shale and Quartzite, which is generally 45 to 50 m thick and is composed of shale, quartzite and minor dolostone. The base of the unit is marked by the Blue Shale, a massive to weakly bedded carbonaceous shale carrying large blebs of pyrite, varying from 2 m in the east to 12 m in the centre and 5 m in the west where it is less carbonaceous. The beds above the Blue Shale vary markedly in facies and thickness laterally. Eastward the Blue Shale disappears, as do the other facies of the Interbedded Shale and Quartzite, and the Intermediate Dolomite, such that the Glassy Quartzite at the top of the Lower Roan, is overlain by a condensed sequence of white dolomite and breccia. West of the mined area, the Intermediate Dolomite is dominantly arenaceous, but then becomes more shaley and decreases in thickness from 50 to <20 m (Brandt et al., 1961). Upper Dolomite, that is >500 m thick and is predominantly composed of white talcose and pink dolostone, with minor greenish-grey argillite and dolomitic argillite. An intersection of 22.24 m @ 2.42% Cu has been encountered at the base, separated from rocks of the Lower Roan Group by a polymictic breccia. Abundant breccias appear ~200 m above the base of the unit. However, in the east of the deposit area, these breccias extend down to the base of the Intermediate Dolomite. They comprise rounded to angular clasts of dolomite, argillite/shale and chert, from <1 to ~10 cm in diameter, set in a dark greenish-grey argillaceous matrix. The enclosing quartzites and argillites are partially brecciated. In the middle of the unit, the Barrier Quartzite member has been locally recognised, but is of limited extent. It is overlain by dolomite, talcose dolomite and argillite/shale and is 250 to 450 m thick (Brandt et al., 1961). The Mwashia/Mwashya Subgroup, which at Mufulira is 450 to 600 m thick, and is composed of shale, black-carbonaceous shale and grey, glassy quartzite with minor dolomite and grit bands. Nearby, it also locally includes some dolostones and interbeds of up to 30 m of grey-pink quartzite (Brandt et al., 1961), and is shown by Wimberley et al. (2010) as comprising a basal conglomerate with clasts of Roan Group rocks, a middle unit of siliciclastic rocks, carbonates and shales, overlain by an upper suite of sandstones and shales. The Nguba Group, commences with 140 to 150 m of grey shaly and slightly carbonaceous Grand Conglomérat diamictite, containing a variety of poorly sorted clasts. This is overlain by the Kakontwe Limestone, which is 450 to 600 m thick, composed of grey to white, and moderately well bedded, dolomite and minor shale at Mufulira. The overlying shales, carbonaceous shales, argillite and minor quartzite are up to 3500 m thick in the middle of the syncline to the north of Mufulira, and belong to the upper Nguba and Kundelungu groups (Brandt et al., 1961). Mufulira is located on the southwestern limb of the NW-SE trending, asymmetric Mufulira Syncline, on the northeastern margin of the regional Kafue Anticline. The host sequence and ore deposit, overall, dips at 45°NE on the SW limb, but is locally steep to overturned. 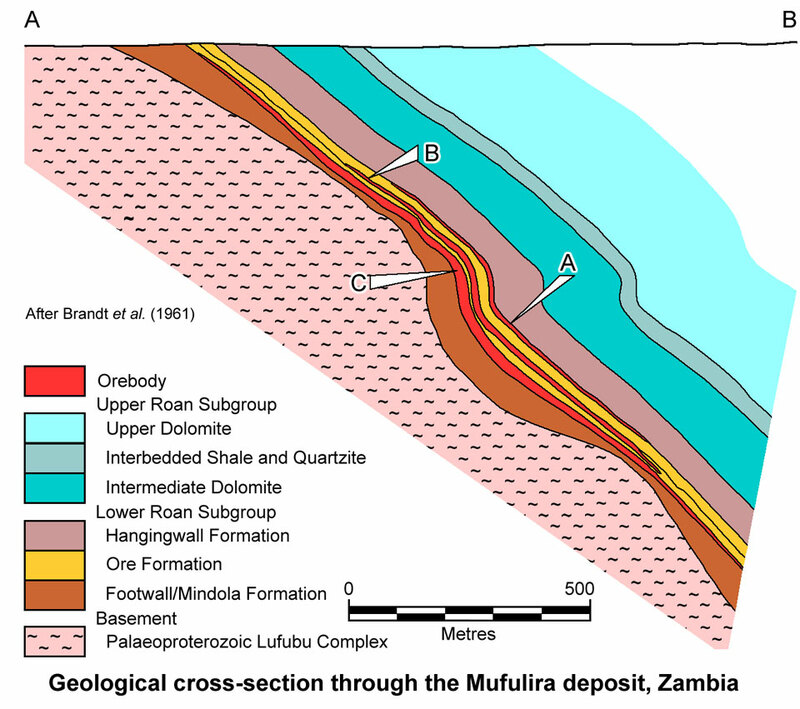 The Mufulira deposit is elongated and plunges at ~10° to the NW. The NE limb of the Mufulira Syncline, which laps onto the Mokambo Dome, is mostly steep to vertical. This limb hosts the smaller Mokambo North and South mineralisation, 12 to 15 km to the NE of Mufulira. In the intervening keel of the synline, the Ore Formation is estimated to be as deep as >10 500 m below the surface. The basement topography at Mufulira appears to have had a strong influence on the distribution of ore at Mufulira. A number of basement rises cut through the sequence, almost to the orebodies, with the highest grades tending to flank these basement hills, while increased pyrite is common over the crests of some of these hills (Freeman 1988). However, a palaeo hill or ridge has never been found to protrude into the lowest, or 'C' orebed, implying that these were not hills during the deposition of the ore host (Fleischer in Fleischer, Garlick and Haldane, 1976). This implies a control based on events during compaction when these buried hill/ridges would have influenced the geometry of the compacting sequence. Where the Footwall Formation is absent and the ore rests on basement, the basement itself may be mineralised. 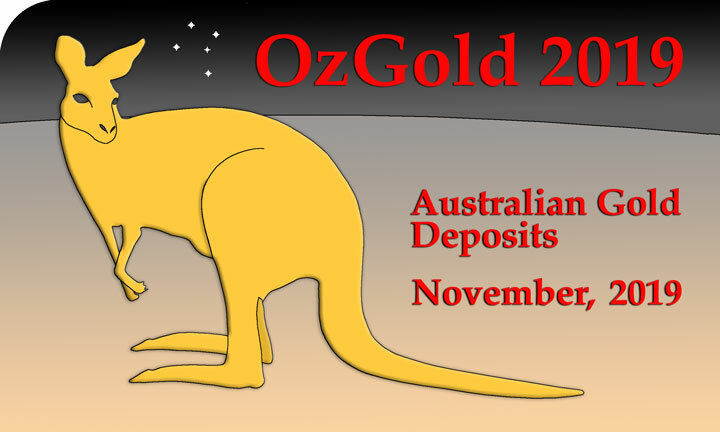 In these locations, disseminated chalcopyrite and/or native Cu is present to about 0.5% Cu for 1 to 2 m into the basement. The base of each of the "Orebody Quartzites" corresponds to an increase in the silicification of the hosts sediments, and the disappearance of banding and argillaceous and arkosic content. The upper limit of each orebody is usually marked by the appearance of fine dolomites and argillites. Copper sulphides occur at 21 distinct stratigraphic positions within the Mufulira mine, of which only three are economically exploited (Fleischer in Fleischer, Garlick and Haldane, 1976). For simplicity in mining the eighteen different ore beds are grouped into five broad mining units, termed the 'C', 'Inter B/C', 'B', 'Inter A/B' and 'A'. The 'C' Orebody is the lowest and most extensive, having lateral dimensions of 5800 m, and is continuous down dip for >1300 m, to at least the 1500 m level and is up 23 m thick, averaging ~14 m. The 'A' and 'B' orebodies cover smaller areas, of 1800 x 900 x 6 (up to 13.7) m, and 3200 x > 900 x 7.6 (up to 15.2) m. Ore, while being largely confined to the 'A', 'B' and 'C' orebodies, is also found within the Inter B/C and Inter A/B quartzites, and at one point where all three overlap is continuous from the base of the 'C' Orebody Quartzite to the top of the 'A' Orebody Quartzite, a thickness of up to 65 m. Elsewhere sections of the 'C', 'Inter B/C' and 'B' orebodies are mined together, with laterally narrow and weak mineralisation within the lower Inter B/C argillites and dolomites, and a wider connecting zone of ore grade in the Inter B/C Quartzite, mushrooming out to connect to the overlying 'B' orebody. Within the 'Inter B/C' and 'Inter A/B' units, mineralisation is generally absent from the finer argillaceous and dolomitic beds, and abundant within most interbeds of arenites, although absent from some of the thicker coarse beds. The stromatolitic dolomites are almost invariably barren, although laterally developed arenites and those between the stromatolites may contain sulphides. However, locally the fine sugary dolomites immediately overlying the 'B' Orebody may contain minor Cu mineralisation, generally <1% Cu. The base of each of the 'A', 'B' and 'C' orebodies closely corresponds to an increase in silicification of the host sediments and the disappearance of the primary sedimentary structures, particularly lithological banding. In these positions the characteristic banding gradually disappears, the rock becomes less argillaceous/feldspathic and grades to more siliceous massive quartzite. In general the 'grade boundary' base of the 'C' Orebody, for example is close to the disappearance of bedding, usually within 1 to 2 m above or below this change. In some cases however, up to 20 m of low grade 1 to 2% Cu mineralisation occurs in this transition zone which may be carried by the higher grade overlying ore. The top of the individual orebodies is generally determined by the appearance of the overlying fine dolomites and argillites. In the case of the 'C' Orebody the top of the orebody is generally very close to the overlying 'Mudseam', although grade commonly begins to decrease over the last metre below the contact. As the Cu drops off, the dolomite content increases correspondingly. The lateral equivalents of the 'C' Orebody Quartzite contains anomalous Cu levels, stated as being of the order of 0.1 to 0.5% Cu at a distance of 1 km to the west of the margin of the orebody. In this zone, trace chalcopyrite and pyrite are recognised. Within the mine, the lateral equivalents to the 'B' and 'A' Orebodies contain 0.2 to 0.5% Cu in less siliceous but more argillaceous/feldspathic quartzites from 500 m to 1 km along strike from ore. Apart from the sulphide content, these rocks are hard to distinguish from the orebody hosts, except by direct comparison where the marginal difference in silica and argillaceous/feldspar content is just discernible. The Mokambo North deposit occurs as 5 lenses, which average 6.2 m in thickness, with respective strike lengths and dips of 200 m - 45°SW; 850 m - 50°SW; 100 m - 65°SW; 1250 m - 65°SW; and 450 m - 55°SW. Mineralisation is hosted by one or two horizons within a Lower Roan Subgroup sequence of quartzites, greywackes, grits and conglomerates. Copper sulphides, predominantly chalcopyrite, ranges from 1.12 to 2.22% Cu over thicknesses that vary from 2.8 to 21.8 m. The thickest intersections are to the south. The deepest mineralisation encountered is at 1200 m. Resources total 12.65 Mt @ 1.61% Cu (Freeman, 1988). The Mokambo South deposit is hosted by Lower Roan Subgroup quartzites, greywackes, grits and conglomerates that strike north-south and dip at 55°W. Mineralisation is confined to a single unit near the top of the sequence. The best mineralisation was near the boundary with the Mokambo North deposit. 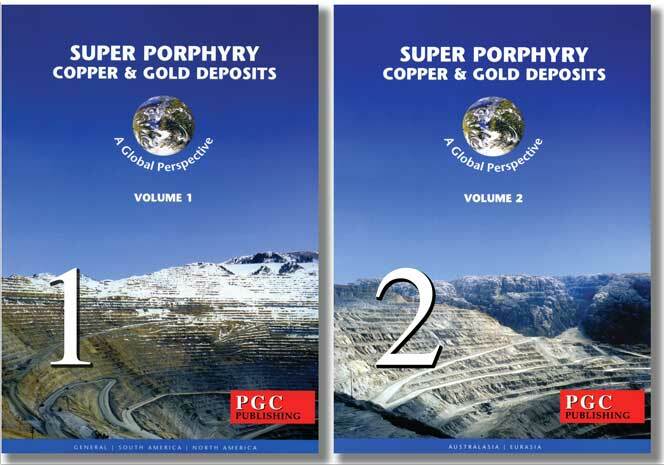 Chalcopyrite is the main copper sulphide, with grades of 1.32 to 3.62% Cu, over thicknesses of 1.5 to 13.6 m, averaging 4.6 m. Mineralisation persists over a strike length of 1000 m, and to depths of between 100 and 1000 m below the surface. Resources are 5.98 Mt @ 2.38% Cu (Freeman, 1988). The Luansobe deposit occurs within quartzites in the same host sequence as Mufulira, also on the SW limb of the Mufulira Syncline, but 6 km to the NW. Resources are quoted at 8.4 Mt @ 1.6% Cu 0.13% Co (Selley et al, 2005), or 5.6 Mt @ 1.58% Cu Total, 0.76% Cu Acid Soluble (Wimberley et al., 2011 for Mopani Mines). The host sequence comprises a 0 to 70 m thick Footwall Formation composed predominantly of grits and poorly bedded conglomerates, with silty partings. The grits grade up into feldspathic to argillaceous quartzite. The thickness varies with the basement topography (Groen, 1961). The overlying Ore Formation is 50 to 110 m thick, and commences with the 15 to 30 m thick E Quartzite, which is moderately well-bedded, feldspathic and argillaceous, grading to a fine to medium grained and gritty variety, and containing beds of grit, conglomerate and sandstone, with argillaceous partings. The overlying D Quartzite has a gradational contact, and is 6 to 8 m thick. It comprises massive to distinctly bedded, light grey, gritty and feldspathic quartzite, grading upwards into a greywacke. The succeeding C Quartzite is similar to the underlying D, but is locally dark, due to minor carbonaceous material and pyrite. This is overlain by a 1.5 m dolomitic shale, termed the "Mudseam", followed by the 9 to 20 m thick B Quartzite, which is similar to the C and D Quartzites, and is, in turn, overlain by the 8 to 20 m thick Lower Dolomite and Shale. The formation is capped by the 6 to 14 m thick A Quartzite, similar to the other quartzites, although it contains numerous cavities filled with anhydrite. The Hangingwall Formation is made up of the 20 to 33 m thick, massive to poorly bedded Argillaceous Quartzite, comprising an argillaceous quartzite to sandy argillite, with shale partings, a local pink dolostone and an uppermost 5 m of siltstone with argillite partings. The overlying 5 to 10 m thick, light grey Marker Grit is a pitted, glassy feldspathic quartzite with quartz and feldspar grit, followed by the 15 to 27 m thick, massive to poorly bedded, grey, Sandy Argillite, and then the 25 m thick, light grey, poorly bedded and hard Glassy Quartzite (Groen, 1961). Sulphide mineralisation occurs as pyrite, chalcopyrite, bornite, chalcocite and sphalerite. Pyrite is dominant from the Mudseam to the top of the A Quartzite. Pyrite with chalcopyrite and local chalcocite are found in the C Quartzite; chalcopyrite, bornite and chalcocite in the D Quartzite, and only chalcocite in the E Quartzite (Groen, 1961). The Kasaria deposit is located adjacent to, and passes under the DRC border, hosted by the same stratigraphic sequence seen at Mufulira. Mineralisation occurs over a 3 km strike length and 500 m width, as discontinuous lenses at three stratigraphic positions, the A, B and C horizons seen at Mufulira. These lenses cross the DRC border at a depth of 200 to 1000 m. Grades range from 1 to 6% Cu over widths of 1 to 18 m, averaging 4.5 m. The host sequence dips at 25 to 30° NE. Most of the mineralisation in Zambia is relatively shallow, at depths of 100 to 300 m, and is mainly malachite, cuprite, chrysocolla, native copper and chalcocite in the upper sections, grading down into a primary ore of pyrite, chalcopyrite and minor bornite. Without a 3 m thickness cut-off, the main lens might contain ~20 Mt @ 2.51% Cu. However, applying cut-offs, the resource is estimated at 5.8 Mt @ 2.57% Cu (Freeman, 1988). According to Fleischer in Fleischer, Garlick and Haldane (1976), there is a general anti-pathetic relationship between the presence of sulphides and anhydrite within the host sequence. Barren interbeds within the Ore Formation, the intermediate hanging wall quartzites, and barren 'ore' horizons adjacent to the Mufulira deposit contain as much as 19 to 31% anhydrite. On the other hand the orebeds themselves contain interstitial dolomite with little or no anhydrite. He also mentions that the drainage problems at Mufulira are due to the dissolution of the high anhydrite/gypsum content of the wall rocks, whereas the ore is less permeable, more competent and less weathered. Discontinuous bands of sulphides, occurring either as 'fly speck' disseminations (much less than 1 mm), blebs (1 to 2 mm) or thin lensoid bands (1 to 2 mm), defining bedding planes at irregular intervals across the host bed, or as irregular clots of weak to strong disseminations up to 10 cm across. In the basal sections of the 'Orebody Quartzites' these sulphides are often concentrated on the foresets and bottomsets of crossbeds, accompanied by rounded heavy minerals. Irregular angular or jagged (but not rounded) clots of weak to dense disseminations of sulphides whose elongation is influenced by bedding, but may also be strongly transgressive. These clots are from a few mm's across to 10 cm or more. While they may appear dense the sulphides are still largely interstitial to the silicate minerals of the arenite hosts. The zonation of ore minerals at Mufulira is more complex than at the other deposits of the Zambian Copperbelt. Within the 'C' Orebody, chalcopyrite is the dominant sulphide mineral, although in sections this grades to bornite dominant. The average grade is 2.5 to 3.5% Cu. Within the 'B' Orebody the predominant ore mineral is bornite and the average grades are from 3.5 to 4.5% Cu . The uppermost 'A' Orebody is also the highest grade, generally averaging 4.5 to 5.5% Cu, with bornite and chalcocite. A small pocket of uranium mineralisation is found at the top of the 'A' orebody in the central section, consisting of yellow uranium ochres. Black disseminated uraninite also occurs at several horizons within the 'C' Orebody quartzite on the western flank of a palaeo ridge, with some associated bright secondary salts adjacent to the ridge. Ore styles at Mufulira, Zambia - Samples from the lower, or 'C' Orebody (left image) and the middle, of 'B' Orebody (right image). Both are silicified quartzites, in which bedding is not obvious, in contrast to the bedded, variably argillaceous arenites stratigraphically above and below each. 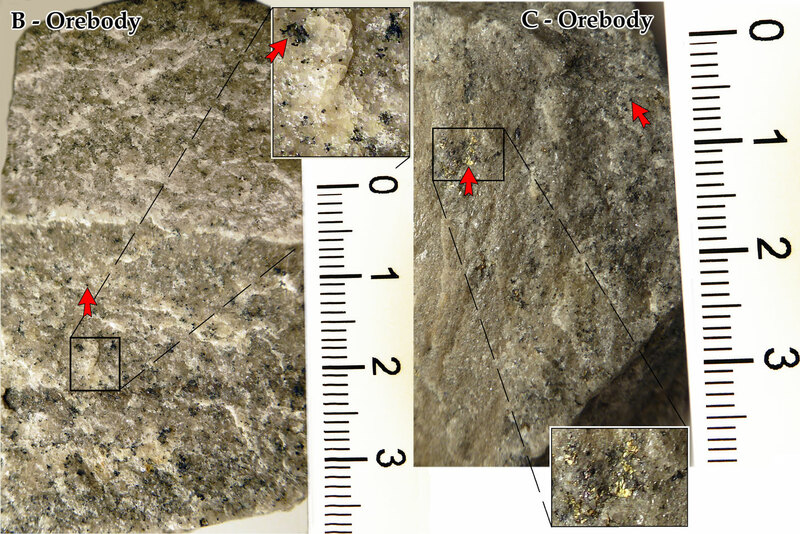 Copper sulphides are dominantly bornite in the 'B' Orebody, but with significant chalcopyrite also in the 'C' Orebody (e.g., left arrow on the right image). These sulphides occur as both fine 'flyspeck' disseminations (e.g., lower left and upper right arrow heads, and virtually all other fine dark specks in the insets and main images), and as aggregates (e.g., arrowhead in upper inset). These aggregates and 'flyspecks' are locally concentrated in diffuse bands parallel to the 'bedding' in the enclosing rocks (e.g., the band across the image immediately below the inset area on the left image). The surface of the left image is perpendicular to 'bedding', while the right image is subparallel to bedding to the left, and cutting it to the right. Scale bars are in centimetres, graduated in millimetres. Samples collected by Mike Porter during a visit in 1992. Photographs by Mike Porter. Alteration is not specifically described within the much of the literature on Mufulira. However underground traverses strongly infer that there is enhancement of silica, alteration of arkose feldspar to sericite and anhydrite to dolomite within the ore zones at Mufulira. As described above, the well developed banding within the footwall arkosic quartzites fades as the base of the ore is approached and the rock becomes more siliceous and sericite rich, with the virtual total loss of primary sedimentary features coinciding with the base of the orebody. Similarly the host quartzites are less siliceous and more feldspathic to argillaceous along strike where not strongly mineralised. The increase in silica in the lower orebody corresponds to the presence of authigenic overgrowths of silica on corroded detrital quartz grains (van Eden 1974), lowering of the detrital feldspar content and increase in the presence of sericite. The detrital feldspars of the footwall arkosic quartzites are generally microcline, while the matrix contains appreciable albite or oligoclase which appear to be authigenic. The more siliceous quartzites have also lost their original sedimentary features almost completely by recrystallisation of quartz and feldspar as seen in thin section (van Eden 1974). This might be taken to imply the introduction of silica, producing authigenic feldspars, altering feldspar to sericite and removing part of this argillaceous material. The silicification decreases upwards into the orebodies, while the argillaceous (sericite) content increases. The characteristic carbonate cement (dolomite) within the orebodies, with varying accompanying anhydrite, contrasts with the anhydrite cement of the lateral equivalents and footwall arkosic quartzites. This also implies alteration of original, mainly diagenetic cement anhydrite, during mineralisation after Annels (1974). Master (pers. com., 1992) notes from personal observation, there is at the base of the 'C' Orebody at Mufulira, a transgressive 'red line' oxidation front marking the change from underlying oxidising conditions to sulphide rich reduced conditions within the orebody, similar to that described at Musoshi by Richards, Krogh and Spooner (1988). At Mufulira, the bornite and chalcocite zones do not contain more free Fe oxides than the chalcopyrite zone as is common in some other sedimenst hosted coper deposits. At the top of the best developed section of each of the orebodies, there is a black carbonaceous quartzite lens known as the 'Greywacke'. This lithology is characterised by the presence of up to 2% carbon and a high percentage of sulphides. Like the other ore bearing arenites it has a low feldspar and elevated sericite content. On its lower and lateral fringes it passes gradationally through a 'mottled sandstone' to the orebody quartzite. The mottled sandstone is a lateral equivalent of the black carbonaceous quartzite, and apart from the mottling, differs from the latter mainly in its lower preserved carbon and increased carbonate. It comprises light and dark grey diffuse patches sub-parallel to bedding or randomly distributed. Copper minerals and organic carbon are more abundant in the dark grey parts while the lighter sections contain more carbonate and are sometimes more porous, probably due to the dissolution of the carbonate and anhydrite constituents (van Eden 1974). In general, there appears to be an inverse relationship between carbon and Cu within these black carbonaceous quartzites. In the 'C' carbonaceous quartzite which contains up to 2% carbon, the grade is relatively low compared to the 'B' and 'A' analogues. For example the 'A' carbonaceous quartzite in places has up to 20% Cu sulphide accompanied by only ~0.5% carbon. Leaching and oxidation of sulphides in the orebodies is general to depths of 60 m below surface, and sporadic below that. Oxidation in some footwall quartzites and grits reaches depths of 600 m or more. These beds are leached and porous (resulting from the dissolution of the up to 35% anhydrite they contain), in contrast to the more silicified orebody quartzites. Below the leached cap zone, malachite is the chief oxidised Cu mineral, generally accompanied by chrysocolla, cuprite or native Cu, as well as some chalcocite which is hard to distinguish from the primary sulphide. Outcrops near the ore horizon within the footwall arenites are limonite stained, but show no indication of leached primary sulphides. At surface the original discovery outcrop had minor, but not pronounced malachite staining. Although the main 'C' Ore Quartzite is followed by a stream, now filled with mine waste, there is little evidence of Cu mineralisation at surface apart from the carbonates at the 'Discovery Outcrop'. Patches of diffuse limonite staining are evident, within a sequence of weathered, pitted (after anhydrite) sandstones and argillite, with carbonate rich bands (with a white powdery appearance). In places the brown staining is more pronounced, reminiscent of weathered sulphide, although it is more likely that this is fall-out from the smelters. 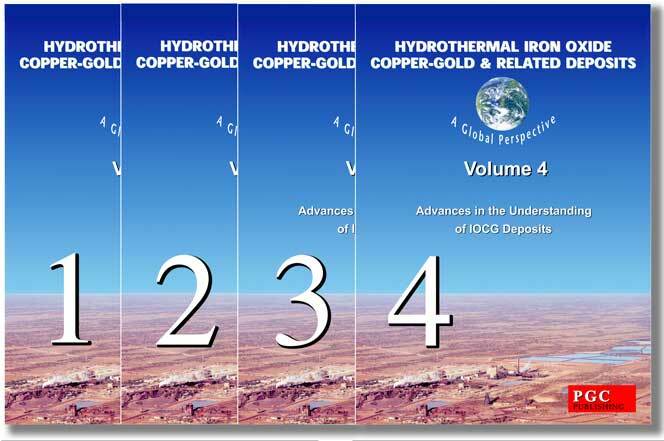 inferred resources - 1.30 Mt @ 1.76% Cu (total), 0.39% Cu (acid soluble). Following the privatisation of Zambian Consolidated Copper Mines, Mufulira was operated by Mopani Copper Mines plc, a joint venture between Glencore International AG (73.1%), First Quantum Minerals Ltd (16.9%) and Zambian Consolidated Copper Mines Ltd (10%).